Neck pain can occur due to a number of reasons & disorders. The neck pain or cervical pain sometimes gets worsened with movement of the neck or turning the head. 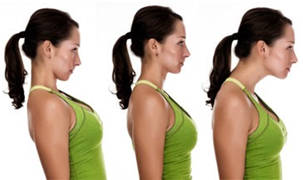 Neck exercises help to relieve neck pain caused by posture problems or medical disorders. 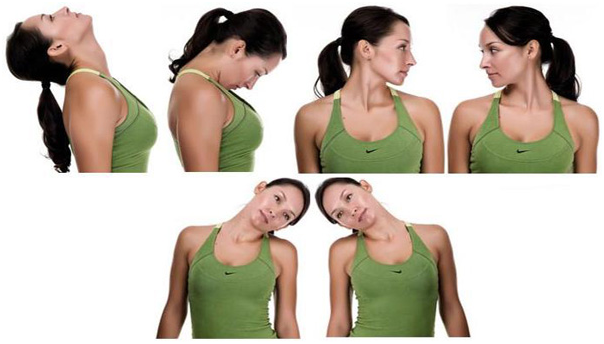 To manage & treat the pain, refer to the instructions for specific neck stretches and neck strengthening exercises. Who Is At A Higher Risk Of Getting Cervical Pain? Officers, typists and others working on poorly and wrongly positioned desks and tables. Individuals involved in occupations including lifting and carrying things on their head. Individuals who sleep in awkward positions, using inappropriate pillows. Individuals who have a habit of holding the phone on one shoulder while talking. Drivers prone to prolonged driving. Flexibility and stretching exercises can expand or preserve the range of motion and elasticity in affected cervical (neck) joints, and thus relieve the stiffness that leads to pain. Corner stretch is a chest & shoulder muscles stretching exercise that is performed in a corner of a room. How to do Corner Stretch? Stand approximately two feet back from the corner, facing into the corner. Join your feet. Place forearms on each wall, keeping elbows little below shoulder height. 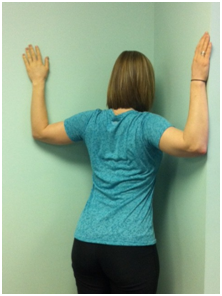 Lean in towards the wall until you feel a moderate stretch in the front of the shoulders and chest without pain. Patients will feel a stretch in the front of the shoulders and chest. Hold the stretch for about 30 seconds to a minute. Repeat it 3 to 5 times a day. What is Neck Release Stretch? 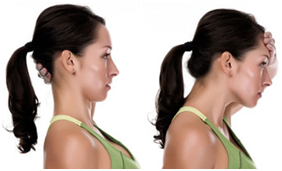 Neck Release is a basic stretching exercise that targets the sides of the neck and stabilizes the torso. This stretching exercise is performed while sitting in a relaxed position on a chair. How to do Neck Release? Stand straight with feet flat on the floor. Extend your right arm along the right side of the chair and place your left hand on the top of your head and slowly tilt your head to the left. To increase the stretch, apply gentle pressure with your hand. Why does Clasping Neck Stretch? The clasping neck stretch targets back of the neck and upper back. This stretching exercise is performed while sitting in a relaxed position on a chair. How to do Clasping Neck Stretch? Clasp your hands and bring both palms to the back of your head. Gently press your hands down toward your thighs, tucking your chin into your chest. Hold this position for 30 seconds, then slowly lift your head up and release your hands. Strengthening exercises help maintain improved posture, which in turn lessens or eliminates recurrent outbreaks of pain. How to do Chin Tucks? Sit or stand tall with your back and neck straight and shoulders back slightly. Tuck your chin in until you feel a mild to moderate pain-free stretch. Keep eyes and nose facing forwards. Hold this position for 3 seconds and repeat 10 times. How to do Static Extension? Place your hand behind your head and slowly push your head back against your hand until you feel a mild to moderate pain-free stretch. Keep eyes and nose facing forwards. Hold this position for 3 seconds and repeat 10 times. Why do Supine Head Lifts? How to do Supine Head Lifts? Lie down on your back on a firm surface, raise your head fully off the surface, taking your chin to your chest, and hold for 5 seconds before returning to your starting position. Repeat the lift 8-10 times, twice a day. How to do Head Rotation? Slowly turn your head to the right as far as you comfortably can and hold for five seconds. Similarly, slowly turn the head to the left and hold for 5 seconds. Apply a heating pad prior to exercise to warm up stiff muscles and joints and make it easier to stretch. After exercise, apply a cold pack to reduce inflammation in the joints and muscles. Seek a cervical spine specialist who is trained to evaluate neck pain and develop an individualized exercise program. Learn the correct form of doing the exercises. Depending on the specific diagnosis and the level of pain that the patient is in, different exercises may be recommended for neck pain. Do not do any exercise before diagnosis accurate cause of the neck pain or stiffness, as different clinical diagnoses will dictate different types of exercises. Never take any pain medications or anti-inflammatories without prescription. Do not drive for long hours; take breaks.